If you feel that you have been given an unjust violation, you can do more than just stew in anger over it. By pleading not guilty in traffic court, you can fight the violation and move to have the charges dropped. Once you receive a traffic violation, Florida courts give you 30 days to inform your county clerk of your intention to dispute the citation. Instructions regarding how you can fight the violation differ based on the county it was issued in. Normally, the ticket itself will have useful information printed on it, such as a phone number, address, and instructions as to how you can contact the court. A traffic attorney can attend your court date with you, and aid in your position, seeking to prove that you did not violate a traffic law. Your attorney will work with you beforehand to gather evidence, witnesses, and explain all options to you as it pertains to the case. Florida courts will not appoint you an attorney in a traffic case. Those who do not hire an attorney will be representing themselves. The day that you enter your plea is not necessarily the day that your trial will be held. You should always plan ahead for the potential of many trips to court before this matter is resolved. Once at trial, your attorney will be able to argue the law, call your witnesses, present evidence, and even question representatives from the police department. After both sides have presented their case, the judge will render judgment. If you are found not guilty the issue is resolved. The ticket is dismissed, and you will not have to pay the fine. The violation will also vanish from your driving record. 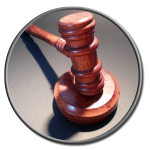 If you are found guilty, you will pay the fine and possibly any court fees associated with the case as well. A lawyer can usually negotiate penalties, and help to minimize your cost and repercussions. Fighting a traffic violation can be a daunting process. If you walk in unprepared you might be setting yourself up for a costly failure which, in some cases, can lead to jail time. The Orlando Law Group will fight for your rights and your freedom. If you have a traffic violation you intend to fight, call us at 407.512.4394. How is Paternity Determined in Florida? How Does Contempt Work in Family Cases?